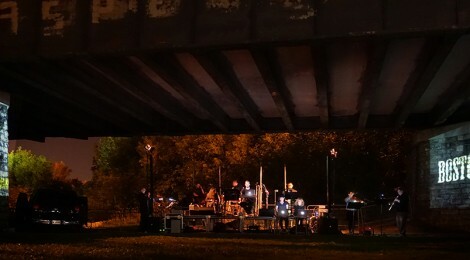 The Noiseborder Ensemble presented a program as part of the w.a.v.e.s Festival sponsored by the City of Windsor and situated in the Odette Sculpture Park along the city’s waterfront. The featured piece on the program was the premiere of Signs and Symptoms; I composed a new score for this piece with an expanded Noiseborder Ensemble instrumentation and Sigi Torinus created spectacular new video. We also presented a few Noiseborder stand-bys: This is an Important Message for Julie Wade, Pitch-a-sketch, Lonesome, and Superstars of Wrestling (pictured).